I was one of the last people to leave Horseshoe lake before the junior carp fish-in and I was 7th back on the lake after. I had thought that the lake opened on the Saturday night at 5pm and I was surprised to find when I arrived at 4.15pm on the Sunday to find guy’s lined up outside waiting to get inside. A few of the guy’s I knew and we talked about the tench fishing etc. One of them had an 11lber last year. As the gates opened we slowly made our way into the fishery. The two guys infront of me managed to bag the swim I wanted so I needed to settle on second best. Their’s was a double swim so I didn’t mind too much. The weather was cloudy with a hint of rain, I had left home with it pouring down and knew it was heading in our direction. I had been thinking about my rigs and had decided on lengthening the hooklink to about 8″ on the inliners. I had soon put out about 1.5 pints of hemp at 36yds and a few dead maggots. Then I put up the bivvi and set up the rods. It was starting to rain heavier and I was glad to get out of it. I cast out at 5.35pm with inline feeders on both rods. The carp anglers had been slower in getting themselves together. Time moved on and then at 7.20pm the rod roared of and soon I was playing a small tench of 4lbs 12oz. She was full of spawn. 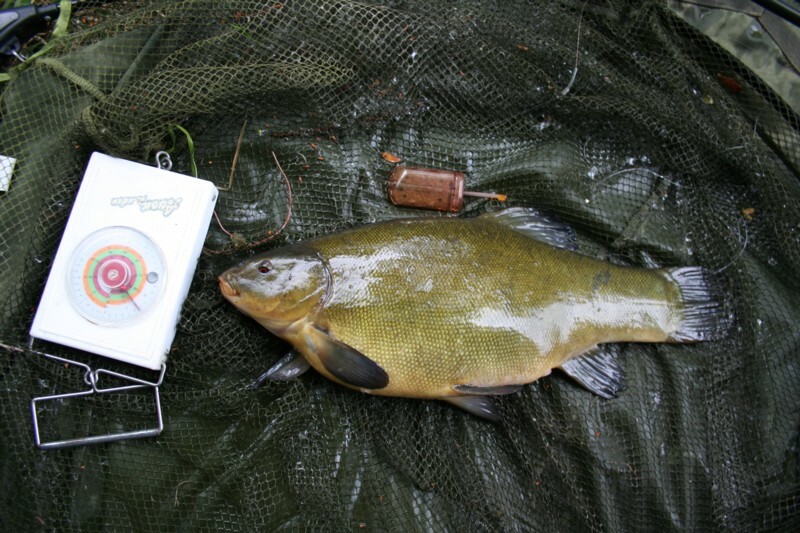 Fat lady tench, ready for the maternity unit. Then again at 7.35pm I had another run which turned out to be a small tench of 2lbs 1oz. Then again at 7.50pm the rod roared off and a 3lbs 5oz tench came to the net. It was not finished there at 8.12pm the rod was off again and a lovely 6lbs 5oz girl came to the net. Mean while the rain drizzled and came down and the evening was dull and getting darker. 8.55pm the last action of the evening came when the rod roared off only for there to be nothing on the end which was a great surprise. That was it for the night and I retired with the light rain falling on the bivvi, better than any lullaby. This entry was posted on Wednesday, June 8th, 2011 at 8:26 pm	and is filed under Uncategorized. You can follow any responses to this entry through the RSS 2.0 feed. Both comments and pings are currently closed.